Texas is a state known for many things - football, oil, BBQ, and cattle to name a few. Dallas, its third largest city, is home to over a million Texans. Take a stroll through downtown and you'll likely notice that many of the public spaces are paved with stamped concrete. 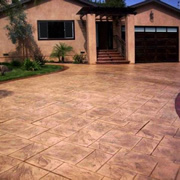 A highly durable and decorative material, stamped concrete is also popular amongst Dallas homeowners. Many people in Dallas have opted for stamped concrete patios, driveways and more. Here is a list of concrete contractors in Dallas. Popular stamp patterns in Dallas include ashlar slate, which has the look of cut stone, and seamless texture skins, which provide overall texture and are often accented with a saw cut design. However, there are many more stamp patterns to choose from, making it possible to have the look of old-world cobblestones or even wooden-planks. Whichever pattern you select, make sure it coordinates nicely with the architectural style of your home. Check out these stamped concrete style match-ups to see what will work with your home. Dallas is known for being hot and humid, making swimming pools a popular backyard addition. 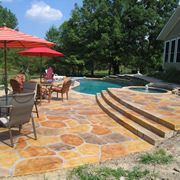 Stamped concrete is a great material for a pool deck because it can be poured in a variety of colors and textures, it will last for many years and is safe. If properly sealed with a UV-resistant sealer, the color of your stamped concrete will not fade in the brutal Texas sun. Furthermore, the textured surface of stamped concrete will prevent slip-and-fall accidents. For extra safety protection, an additive can be mixed with the sealer that will make the stamped concrete even more slip-resistant. As the second largest state, Texas is also famous for its size. In fact, the slogan for the Dallas Convention & Visitors Bureau is "Big Things Happen Here". With that in mind, many people in Dallas live in large, homes that deserve a beautiful driveway to usher guests to the front door. 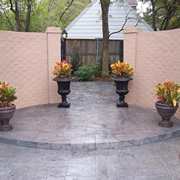 Stamped concrete can provide the look of stone, brick or other materials at a fraction of the cost, with a quicker installation and less maintenance. The occasional rinse with a hose and a new coat of sealer every few years will keep your stamped concrete looking as good as the day it was poured. 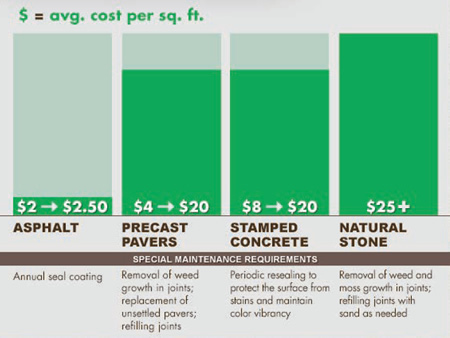 See the stamped concrete infographic that originally featured this chart. In Dallas, you may not notice a fall chill in the air, but you are likely to catch football fever. 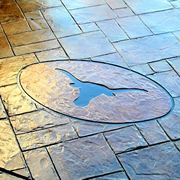 Whether you're a Cowboys fan or you prefer college ball, you can express your team pride with stamped concrete. There are many different patterns for stamped concrete that mimic stone, brick, wood and other materials. However, custom stamps can also be created, as with the example at left of the UT Longhorn logo created by Concrete Miracles in Waxahachie.